In this triple bill of works by Christopher Wheeldon from the Royal Ballet, it was especially pleasing to see the full version of After the rain. Its visually arresting choreography for three couples in the first part, performed to Tabula rasa by Arvo Pärt, shows Wheeldon as his sculptural best as arms and legs swing from pose to pose and dancers move in unison and counterpoint. Dressed in grey practice clothes the six dancers perform in front of a geometric lighting design (59 Productions) consisting of of two squares of light. A central one, blue-ish white in colour, sits inside a larger one of grey-ish blue. Simple but effective, these two squares echo the colours of the costumes and also the formally structured choreography. The pas de deux that follows, often danced without the opening movement, was a disappointment for me. Perhaps I needed to be sitting closer as I missed the quiet emotion that I have seen in performances by other companies? But then a seat in the theatre shouldn’t affect such things if the work is well performed. Perhaps too the physiques of Zenaida Yanowsky and Reece Clarke, who danced the pas de deux, were not far enough apart from each other to highlight what I think are the qualities of this section, danced again to Pärt, this time to the gently reflective Spiegel im Spiegel? The work was made originally for Wendy Whelan and Jock Soto of New York City Ballet and together, with their very different body shapes, they suggested an entrancing strength and frailty that was not apparent, and that I missed, with Yanowsky and Clarke. In fact I’m not sure what their performance suggested beyond a dance for two. 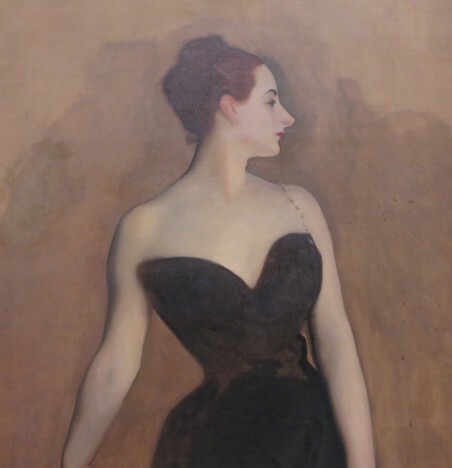 Wheeldon’s newest work, Strapless, a one act narrative ballet centring on the scandal surrounding the showing of John Singer Sargent’s portrait of Mme Gautreau in Paris at the Salon of 1884, was a mixed blessing. When the curtain went up on an empty picture frame attached to a grey-coloured screen I was consumed by curiosity. How would this work unfold? And the opening moments, as Mme Gautreau took her time choosing her wardrobe for the unveiling of Sargent’s portrait while her husband fussed at her slowness, was very nicely choreographed with movement that defined the two characters. Strapless returned in its closing scene to that opening picture frame, which this time was not empty but contained the finished portrait, although now Mme Gautreau was broken in spirit by the scandal that emerged when the portrait showed that one strap of her black gown had slipped off her shoulder. Without the trappings of her former life, and dressed only in a skin-coloured, body-hugging costume, we watched as she sought to make sense of her situation. In between the opening and closing scenes, the work felt like a cross between a Broadway musical, with a ‘chorus’ of dancers representing Parisian society performing choreography that seemed like it had come from a Busby Berkeley show; and Agnes de Mille’s Fall River Legend when that same chorus started to look like tight-lipped parishioners. The score from Mark-Anthony Turnage didn’t help either as it hardly sounded like the era of La belle époque. Lauren Cuthbertson as Mme Gautreau was not having one of her best nights, unfortunately, and was a little unsteady on occasions. And with so many changes of scene in a one act ballet—the work began in 1884, slipped back to 1881, came forward to 1883 and ended where it began in 1884—there was a need for moveable scenery (screens, door frames and the like), Unfortunately again, the scenery was trundled on and off very noisily and so many people (characters and scene changers) constantly slipping on and off stage was decidedly disruptive to the smooth unfolding of the storyline. I also found it hard to follow who was who among the male principals. The printed program, like all Royal Ballet programs I have encountered, was excellent, full of explanatory notes and articles, but any work for the stage needs to be easily understood, I believe, without having to resort to reading a convoluted story in a program. Circumstances were such that I was unable to stay for the final Wheeldon work, Within the golden hour. But perhaps it was just as well. I am able to retain, as a result, an image of a work I enjoyed immensely on a previous occasion in San Francisco. The image above is a detail of an unfinished version of the Sargent portrait, which I saw in the Tate Britain and which has no strap at all on Mme Gautreau’s right shoulder. In the version that was shown in the Salon of 1884, and which caused the scandal, the right shoulder strap was painted as having fallen off the shoulder. The final version, in which Sargent repainted the fallen strap into its regular position, is in the Metropolitan Museum of Art, New York.